The marker stands on the south side of SH 240, 7.1 miles to the west of Burkburnett, near the junction of FM 1813. 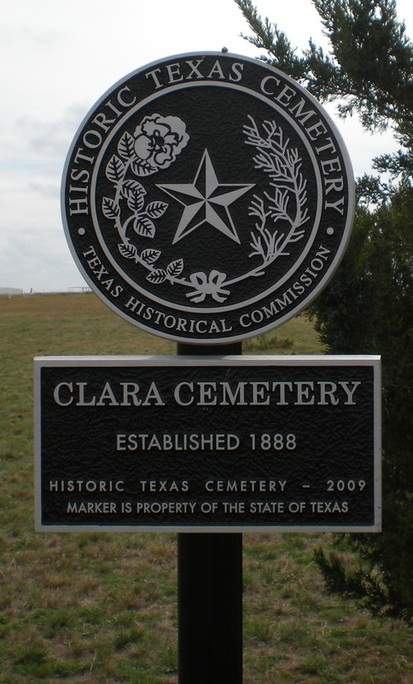 GPS 34-degrees 05' 30.5" N 98-degrees 41' 48.9" W.
The cemetery is located 7 miles west of Burkburnett on Clara Cemetery Road, off SH 240 or FM 1813. Herman Specht migrated in 1870 to Galveston from Germany. In 1884 he married Clara M. Vogel Lange (1853 - 1912), a wealthy widow, adding to earlier property holdings in Galveston. He began buying extensive tracts of land in northern Wichita County, which eventually totaled 21,000 acres. 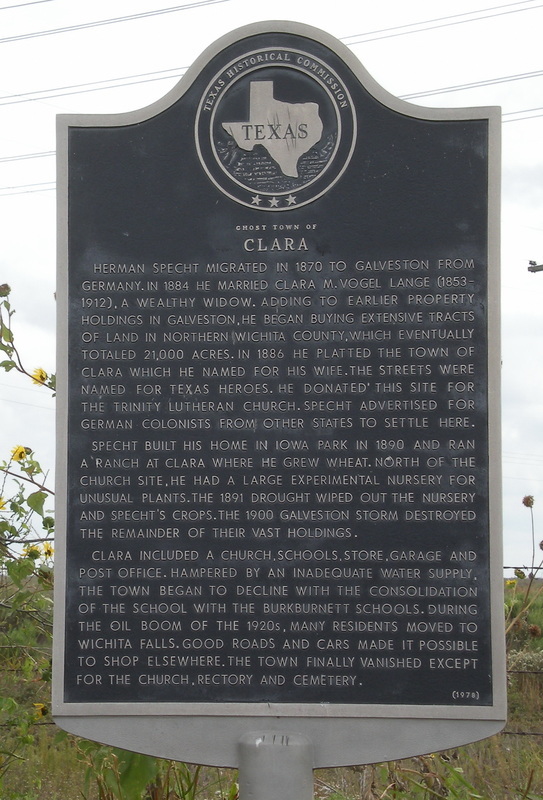 In 1886 he platted the town of Clara which he named for his wife. The streets were named for Texas heroes. He donated the site for the Trinity Lutheran Church. Specht advertised for German colonists from other states to settle here. Specht built his home in Iowa Park in 1890 and ran a ranch at Clara where he grew wheat. North of the church site, he had a large experimental nursery for unusual plants. The 1891 drought wiped out the nursery and Specht's crops. the 1900 Galveston storm destroyed the remainder of their vast holdings. Clara included a church, schools, store, garage, and post office. Hampered by an inadequate water supply, the town began to decline with the consolidation of the school with the Burkburnett schools. During the oil boom of the 1920s, many residents moved to Wichita Falls. Good roads and cars made it possible to shop elsewhere. The town finally vanished except for the church, rectory, and cemetery. For information about Clara at the Handbook of Texas Online, click the button below. 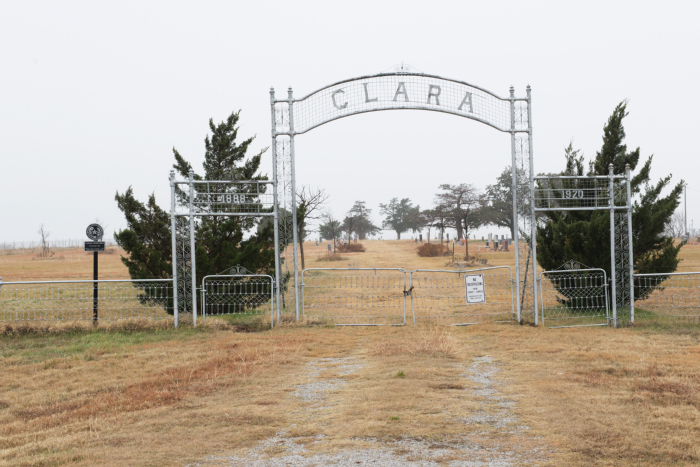 The gate to Clara Cemetery.